Liczba stron: 699 Jest to ujednolicona liczba stron, która ułatwi Ci porównanie długości książek. Każda strona Legimi to 200 słów. A man of unwearied industry, inflexible constancy, sound, clear, and deep understanding and untainted integrity; so that whenever he was blinded, it was by the passion that he had for that which he esteemed the good and interest of the State.”—Sir William Temple, Observations on the United Provinces, 1672. Florent Van Mander, comfortable after his dinner, sitting at his open window smoking, and watching the people pass up and down the Kerkestraat, was surprised, not disagreeably, by the servant entering his solitude to announce a visitor owning a foreign name she stumbled over.Hyacinthe St. Croix—Van Mander had known him in Arnheim when he himself was a magistrate’s clerk there, ambitious, with an eye on the Hague, and the Frenchman a half disavowed agent of the Marquis de Pomponne, some one who had travelled the Provinces several times already, observing, noting, making acquaintances and gathering information where he could.The young secretary called for candles—he had been sitting in the dark—and closed the window.On the heels of the maid with the lights came St. Croix, better dressed, more self-confident, more assured in manner than formerly.The two greeted each other formally. “I did not know that you were at the Hague,” said Van Mander. “How did you find me?”The Frenchman laid his hat and gloves on one of the high-backed chairs. “I was passing through Arnheim the other day—I called upon your uncle and he told me. You have a good post.”Florent put a chair for his guest and took one himself the other side of the small dark table; between them stood the two heavy branch candlesticks, glimmering each in the light of the other candles that illuminated the small, neat room with its deep window-seat, polished wood furniture, plain engravings on the walls and Delft pottery on the chimney-piece.Florent refilled his pipe and invited the other to smoke. The two long clays soon filled the chamber with slow, fragrant smoke. “So you are in the service of M. de Witt,” remarked St. Croix. “Yes.”The Frenchman smiled as he pondered on the best means of getting what he wanted from the laconic Dutchman; it was astonishingly difficult, he found, to deal with a nation so blunt and so reserved.In the silence that followed Florent stared at him stolidly, marking every detail of his appearance, his short red jacket of the newest French fashion showing the laced shirt beneath, the cravat and ruffles of lace, the silk stockings and shoes with ribbon rosettes, the frizzled, fair hair that framed the small-featured, rather insignificant face of Hyacinthe St. Croix.Van Mander had the national contempt of foreign luxury, but these signs of prosperity annoyed him in a slow kind of way. He knew St. Croix was of the small gentry, no better born than himself, and not so long ago no better dressed; now he contrasted this gay attire with his own serviceable grey and worsted hose, and wished he had been the one to find such profitable employment. “How do you like M. de Witt?” asked St. Croix suddenly. “Very well,” said Florent.The Frenchman regarded him out of narrowed eyes, and asked again, with equal abruptness— “Have you seen the Prince of Orange?” “No.” “But you have heard, since you have been at the Hague, a great deal of him?” “I have heard of him,” answered Florent.St. Croix laid down his pipe. “You have drawn your own conclusions, of course,” he said. “You were always shrewd.”Florent was flattered and excited; he managed to show neither feeling. “I have drawn some conclusions,” was all he admitted. “On the position of the Prince—and of M. de Witt?” “I have only been at the Hague a week——”But Hyacinthe St. Croix knew fairly well the man he dealt with. “Come,” he said in an intimate tone that swept aside evasion, “you know as well as I do that this Government must fall.”The words gave the young secretary a shock. He sat silent, sucking his pipe, not wishing to admit that he was startled.The Frenchman leant back calmly in his chair. “The whole feeling of the country is against M. de Witt,” he continued. “You must have seen it.”It occurred to Florent, in a vague, impersonal sort of way, that the Grand Pensionary’s secretary had no right to be listening to these things, or even to be speaking at all to a Frenchman intriguing for his Ambassador; but he told himself that he served success, and success did not seem to lie with M. de Witt. “Yet we are at peace at home and abroad,” he remarked, to probe the other.St. Croix smiled. “You think of the Triple Alliance,” he said. “True—only signed this year,” returned Florent. “Still there is always France.” “Also do not be too sure of England,” said St. Croix. “Despite the Triple Alliance—she stands very well with France—I could tell you something——”Florent Van Mander looked him straight in the face. “Do you mean that France and England might combine for the restoration of the Prince of Orange?”The Frenchman lifted his eyebrows. “Upon conditions—they might. 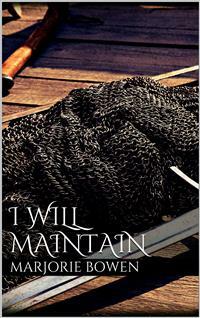 If there were a war what could M. de Witt do?”Van Mander thought a moment. “He beat England in ’56—but now——” “He could do nothing against France—that is obvious.” “Yes, it is obvious,” admitted Florent. “And the prospect is threatening.” “I know——” “Well, you see the part the Prince will play?”There was a little pause, then the Dutchman said slowly— “He is King Louis’ cousin and King Charles’ nephew——” “You take me,” replied St. Croix, “the Prince is related to their Majesties—and he has no cause to love M. de Witt.”Florent drew a quick breath. “You think he … would work for France?” “Can there be a doubt of it?” smiled St. Croix.There was no answer from Florent. He laid down his pipe and sat still, considering.Rumours, whispers, hints were taking at last tangible form: this young prisoner, pupil of M. de Witt, was to be the instrument to deliver the country into the rapacious hands of France. Well, there was little cause to wonder; indeed he had almost guessed it. The Prince had, as St. Croix said, little cause to love either M. de Witt or his Republic.He raised his grey eyes and looked into the Frenchman’s face— “These are strange things to say to a Dutchman and a servant of M. de Witt.”St. Croix answered quickly— “But you serve success.”At these words, that he did not recall having ever uttered to this man, Florent was again silent. It was perfectly true; he was at the beginning of his career and ambitious; he had no desire to follow a falling cause. The Republic was no more to him than the Prince, he told himself; and there was no reason that he should not, out of the crisis that threatened, earn a place and distinction for himself.St. Croix observed him closely. He was not afraid of having said too much, for he had read his man, some years before, in Guelders. “It seems I serve the wrong master now,” said Florent at last, with a grim set to his mouth. “I must not look out for fortune in the train of M. de Witt.”The Frenchman answered slowly and with meaning— “There is fortune, and great fortune, to be found in the service of M. de Witt, by men like you who know how to look for it.…”Once more Florent was silent. He kept his eyes fixed on the dark surface of the table, where the reflected lights of the candles glimmered. He thought that he understood. “The Prince,” continued St. Croix, “and the power behind the Prince, can be very well served by one in the pay of M. de Witt.”Florent was now sure that he understood. Not by being loyal to his master, but by betraying him was he to satisfy his ambitions. The way of success lay not with the Grand Pensionary—but with the Prince, who was another name for France.For the moment his instinct was to resent this calm suggestion that he was the willing instrument of foreign intrigue, but quick reflection showed him the folly of it. St. Croix knew him; some time past, in Guelders, he had taken money for such information of Dutch politics as he could command. His hesitation took another form. “How am I to know that this Prince of yours is worth serving—at a risk?” he said. “You know that France is worth serving.” “Buat died,” remarked Florent dryly, “for tampering with France.” “Buat was a fool,” returned St. Croix; “and we do not want any knight-errantry from you—one of M. de Witt’s secretaries cannot fail to be useful—you will see how.” “Yes, I see how,” answered Florent; “but at present M. de Witt represents the Government and the law, and the Prince is a powerless cipher——” “Not so powerless; we are in touch with him, he commands a section of the nobles—and he has the name.”Florent, hearing again the words used by Sir William Temple, started inwardly. It was curious that the name that owed its prestige and its weight to the fact that it was the name of the man who had first given Holland her liberty was to be used now to aid in her downfall. “He is a boy,” said Van Mander quickly. “He has been brought up by M. de Witt—educated as a republican——”St. Croix smiled. “Is M. de Witt clever enough to train a prince into a commoner? I do not think so.”Interest shone in Florent’s grey eyes. “How far has the Prince gone—with France?” “He is of an extraordinary caution—he will not commit himself while he is in the power of M. de Witt, but take it from me that he does not love him.… Has he cause to?—after the Act of Exclusion?… His only hope lies in England and France, and he knows it.” “You confirm what I have ever heard,” answered Florent. “The Prince is only a figure-head,—a cloak to cover the designs of France.”St. Croix nodded. “Put it so if you will. And now,” he instinctively lowered his voice, “I come to the main object of my visit.”A little colour flushed Florent’s face. He had wondered from the first what particular meaning there could be in St. Croix seeking him out. His position was one of power certainly, if put to a traitorous use, but De Pomponne must have many agents and spies. He waited. “You will understand,” continued St. Croix, leaning forward across the table, “that the Prince is kept very close. His governor, his tutors, his gentlemen, are all M. de Witt’s men and practically his jailers. He cannot go abroad unattended nor receive any one alone; his letters are read—his movements, his speech, watched. It is almost impossible for us to convey to him any message—M. le Marquis de Pomponne’s audiences are formal, and always under the eye of some creature of M. de Witt,—here you can help us.”Florent still waited. He would not, on the first asking, have betrayed M. de Witt wholesale, but he was not averse to some service to the other side.The Frenchman smoothed down the ruffles at his wrist, keeping his eyes on his listener. “M. de Witt visits the Prince almost every day—Tuesday afternoons he devotes to instructing him in politics, afterwards going to the assembly in the Binnenhof. It is his practice to take one of his secretaries with him—it would be possible for this man to convey a packet to the Prince.”Florent answered quietly, but his eyes shone— “You want me to try?” “Yes.” “A servant of the Prince whom we have used,” St. Croix went on, “as a go-between has lately been suspected, and dismissed by M. de Witt; we are hard put to it for a means to communicate with the Prince.”Florent straightened himself in the stiff chair. To-morrow was Tuesday. “Van Ouvenaller accompanied M. de Witt last week,” he said. “I think it very likely that M. de Witt will request me to do so this—but I shall be left in the antechamber.…”St. Croix shrugged his shoulders. “As to that—you must find your chance—better wait than risk detection.… I leave it to your discretion.” “I am not imprudent,” smiled Florent. “Give me the packet—if I go I will attempt it; if not I can, as you say, wait.…”The Frenchman took a thick, folded letter from the inner lining of his red coat and laid it on the table between them. “If that reach His Highness safely it will be a service M. de Pomponne will not forget,” he said impressively. “I will do my best,” answered Florent, “but I still value my place; while M. de Witt is Grand Pensionary I think it worth while to be in his good graces.”Hyacinthe St. Croix rose. “France has her heel on Europe,” he said. “With the help of this little Prince she will have the United Provinces—” he began to pull on his fringed gloves—“I give this Government two—three years—no more.” “There is England,” remarked Florent, still thinking of the Triple Alliance. “England—like Sweden—may take her price,” returned St. Croix.Florent rose too. “The politics of this land are shaken up and down like sand tossed in the palm,” he said, as if he had suddenly roused himself. “I am in the employ of the Government, but in no way bound to any master—tell M. le Marquis de Pomponne so—as M. de Witt’s secretary I know something.…” “How much?” asked St. Croix, lacing his gloves.Florent answered steadily— “I know that M. de Witt is afraid.” “Of France—of England?” “Of William of Orange.” “He hath good cause,” answered St. Croix. He picked up his hat with the fine buckle, his satin-lined cloak. “I think if His Highness once gave the signal the whole country would be in arms. There is a strange revulsion of feeling against this ideal republic, is there not?”Florent was taciturn again. He raised one of the brass candlesticks. “The stairs are very dark,” he said, and opened the door. He made no show of friendliness or hospitality, no attempt to draw the Frenchman. He wanted to be alone. “When shall I see you again?” he asked.St. Croix hitched up his sword-belt. “Better not meet here again, nor at the house of M. le Marquis where I stay.… There is a small tavern kept by a Frenchman near the Nieuwe Kerk—the Nieuwe Doelen he calls it—we may meet there—say Wednesday evening—six of the clock.”Florent came out on to the landing with his visitor and held the candle so that a flickering radiance was cast down the sombre stairway. “I will come if I can,” he answered slowly. “Au revoir,” said St. Croix, and added some laughing commonplace for the benefit of any maid-servant who might be in hearing.Florent waited with the light until the gay feather and mantle had disappeared round the bend of the stairs, then he returned to his room and took up the letter left by St. Croix. It was sealed in three places with the Marquis de Pomponne’s signet, and addressed formally to: “His Highness William Henry, Prince of Orange Nassau,” etc., as if the scribe had enjoyed writing out the fine titles.Fine titles indeed to belong to an insignificant tool of France—but Florent at once checked that foolish reflection. The Prince was behaving prudently, much in his way as he, Florent Van Mander, was, in following success and securing his own ambitions. He was doing, in fact, the one thing there was for him to do—a bargain with France or England was his one means of escape.Florent turned the letter over. He was curious to know exactly what it contained; he wished that he had asked St. Croix.He was curious, also, to see the Prince, to judge him for himself. He thrilled with unreasonable excitement at the thought of meeting him.A distant, threatening noise coming from the street below made him quickly put the letter into his pocket and go to the window.He was not in much doubt of what it was—another of those noisy, useless Orange riots, dispersed by the train-bands and always ignored by M. de Witt; a handful of discontented people headed by boyish enthusiasts like the young student Jacob Van der Graef. Florent was not greatly interested in them.He leant out of the window.Everything had faded into the heavy grey of a cloudy night; the straight lines of the houses opposite the great tower of the Groote Kerk, the poplar tree that rustled so persistently; a new moon, clear out, hard, shone through the hurrying vapours.By the street-lamps’ feeble glow Florent could see some people running up the street towards the scene of the riot; they carried sticks and swords, and some wore Orange favours.He smiled cynically to himself, reflecting how little they knew that the Prince whom they shouted for as an embodiment of all patriotic virtue was in reality sacrificing them to their greatest enemy, bargaining away their liberty for his personal advancement.They are mostly fools, he thought, and shivered back from the sea wind, closing the window.For a long while he sat silent in his comfortable room, smoking, and staring at his own shadow the candlelight cast over the dark walls. Once or twice he took the letter given by Hyacinthe St. Croix out of his pocket and fingered and scrutinised it, thinking the while—thinking.And from without came the remote sounds of the students fighting, shouting, tussling with the train-bands in the name of William of Orange.Florent Van Mander almost envied men who could be so simple.